Need to raise funds for your non-profit community group or school ? DeBrito Chocolate Factory has a program that can help you meet your fundraising goals! Your group can sell luscious caramel apples, receiving up to $5 per apple for your fundraising efforts. Plus, you'll be selling a delicious product made by a local producer who stands by their product. Please note that we are located in California, south of the San Francisco Bay Area, and that all fundraising apples must be picked up at our Hollister location. We do not ship fundraising apples, so please plan accordingly. 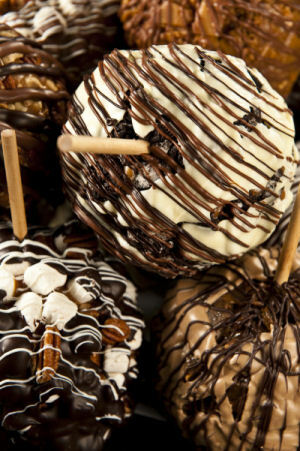 Your customers will be able to choose from a wide variety of caramel apples from the Plain Jane to Death By Chocolate. We'll provide up to 50 sales packets* to your group so that your customers can see exactly the yummy apples they are ordering. At the end of your sales period, bring in your tally sheet and payment, and we'll get to work. Then come pick up your order (bring an enclosed vehicle large enough to accommodate your order) and distribute to your customers within 2 days of pickup (remember, our caramel apples are perishable). Since your group must sell a minimum of 140 apples and assuming your group receives an average of $5 profit per item, your group could raise a cool $700 or much, much more!! *Additional sales packets available upon request. Be advised minimum apple order requirement changes to 3 apples per packet. ♦ Sell caramel apples from $12-$13 each. Your group earns up to $5/apple. Give DeBrito Chocolate Factory a call today at (800) 588-3886 and discuss your fundraising goals and schedule your fundraising date. You can download a sample of our Fundraiser Agreement form below. Once you have a confirmed a date, please request an agreement by phone at (800)588-3886 or by email at fundraiser@debritochocolate.net to book your fundaiser. In addition, we require that a Credit Card Authorization Form also be completed at that time. Good luck and happy fundraising!